Something closer to home was an on-line presentation I gave last week entitled Exam Confidence. Part of the presentation specifically deals with exam stress, something that many students may be experiencing just at the moment as they begin to realise the November and December exams are just around the corner. The first thing to say is that to feel stressed is a perfectly natural reaction; it is the result of being faced with a challenge that initially at least, looks impossible to overcome. The body’s natural reaction to this is to increase your heart beat and get you ready to hit something or run, the fight/flight principle. 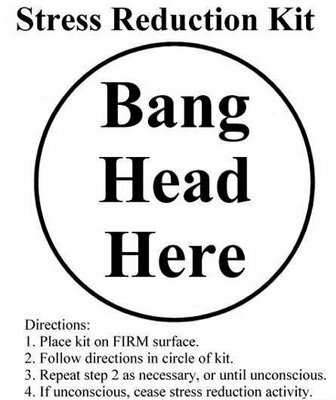 Now a few million years ago this was helpful, but in an exam room…. It‘s not the question that is shouting, it‘s you, and what you say to yourself makes a huge difference to how you feel and the level of stress you will experience. Now of course the truth might be that you can’t do it, but the problem with stress is that it will paralyse the logical part of your mind. In these circumstances you are programmed to fight or run, not think. So you need some strategies to cope, to reduce the stress, so that you can at least begin to think about what you can do rather than what you can’t. 1 Recognise that it is your voice and that by changing what you say will change the way you feel. Think more positively, say okay I can’t do this but what can I do? 2 Take a deep breath, look around the room, say to yourself, if I can’t do this then I bet no one else can. 3 Reframe what you see, this is just one question, not the entire exam. 4 Think about the bigger picture, this is just an exam, you can always sit it again, it is not life or death. 5 Focus your attention elsewhere by doing something you can do, no matter how small, a question that only has 5 marks perhaps. I may do more on how to cope with stress in future blogs but for now I will leave you with the wise words of psychologist and philosopher William James. This entry was posted in Exam tips, Stress and tagged Exam tips, Stress. Bookmark the permalink.